We’re able to run our ‘infinity white’ backdrop up to a height of nine foot and down to the floor if required ( for products as big as vending machines). 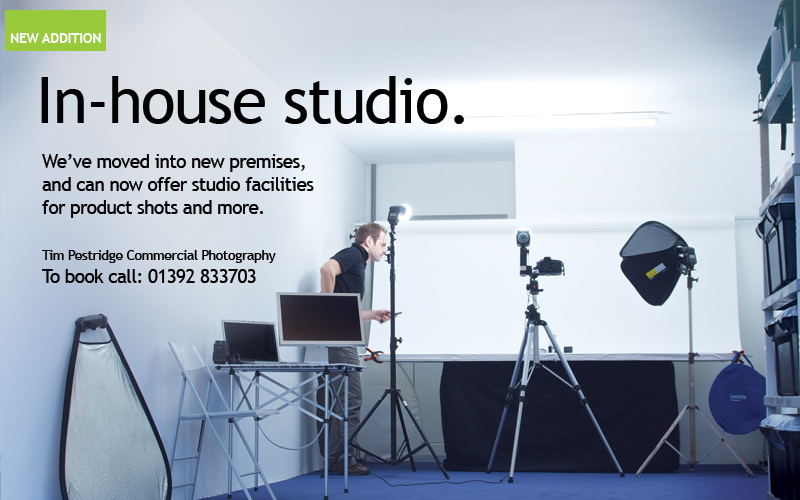 The studio is versatile and can be set up across the room (as shown below), or lengthways to suit you. Kitted out with constant or flash lights and soft boxes, we can adapt to shoot most subject matter. An Apple Mac running a second Cinema monitor means clear and immediate reviewing of your photography. Height is just over 10 feet, length approx. 45 feet. The studio has a private secondary adjoining room with kitchen facilities as well as a toilet. Mobile reception is OK, not brilliant, but we figured you wouldn’t want your photo shoot to be disturbed. Bringing large or heavy products couldn’t be easier: access is via a 10 foot wide door from a wide and flat parking area. There’s space for most sized commercial vans too.